Black service members are significantly more likely to face military punishment than their white colleagues, according to a new report that alleges rampant racial bias in the military. The non-profit advocacy group Protect Our Defenders sifted through almost a decade's worth of government data obtained via Freedom of Information Act looking for clear disparities in the judicial treatment of white and black military personnel. "The data shows that, for every year reported and across all service branches, black service members were substantially more likely than white service members to face military justice or disciplinary action, and these disparities failed to improve or even increased in recent years," the report stated. "Depending on the service and type of disciplinary or justice action, black service members were at least 1.29 times and as much as 2.61 times more likely than white service members to have an action taken against them in an average year," according to the report. Protect Our Defenders received data from four service branches — and found a higher proportion of discipline against black service members in all four. Black members of the Air Force were 71 percent more likely to "face court-martial or non-judicial punishment than white air force members in an average year," the group said. In the Army, black soldiers were 61 percent more likely to get "general or special court-martial compared to white service members." And in the Navy, black sailors were 40 percent more likely than white sailors to be referred to special or general court-martial, the report said. Once referred, whites and blacks were equally likely to be convicted, the study found. Not all branches provided the same data, the study's authors said, making exact comparisons difficult. One of the biggest discrepancies came out of the Marine Corp where black Marines were 2.61 times more likely than white Marines to receive a guilty finding at a general court-martial. In non-judicial punishment proceedings black Marines were 32 percent more likely to be found guilty than whites in an average year, the report said. "While I was aware that this may have been happening, what surprised me is how pervasive it was across all boards in the military," said Col. Don Christensen, former chief prosecutor of the Air Force and president of Protect Our Defenders. "What's more alarming is that it's not getting better, it's getting worse," he said. The report identifies that the pattern of bias toward black personnel has gotten progressively grim over the years. Christensen said the reason behind the bias could be because the "system is rigged" against African Americans in the military. African-American are less likely to receive promotions or in-military education to advance, he said. The Pentagon said it would review the report. "It is longstanding Department of Defense policy that service members must be afforded the opportunity to serve in an environment free from unlawful racial discrimination. The Department will review any new information concerning implementation of and compliance with this policy once given the opportunity to review the report," Department of Defense spokesperson Johnny Michael said in a statement to NBC News. Findings in the report also suggest that "decision-makers" have a "racial bias" that is causing the severe discrepancy. 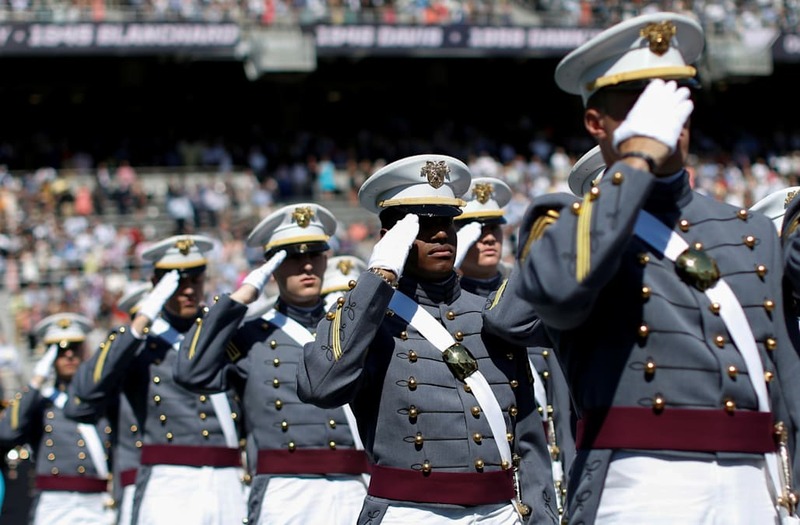 "The report, while certainly eye-opening, should only be truly surprising if we believe that the United States military is a colorblind institution, which it is not and has never been," said Chad Williams, a professor of African and Afro-American Studies at Brandeis University. He said the same racial biases in the civilian criminal justice system are also in the military justice system. "The report reflects the continuation of a long historical practice of viewing black servicemen and women as a 'problem' that must be controlled through various measures, mostly notably the military justice system," he said. Evidence for other racial groups also varied, according to the data. Asian service members had lower "military justice or disciplinary involvement than their white counterparts" within the Army and the Navy, the report found. The report also alleges that military superiors were well aware of the racial bias. "Military leadership has been aware of significant racial disparity in its justice process for years, and has made no apparent effort to find the cause of the disparity or remedy it," the report reads. "The leadership has vigorously opposed any suggestion that the commander-controlled justice system is hindered by conflicts of interest or bias and has gone to great lengths to tout the fairness of the system." The military is the most respected institution and it has to live up to that reputation, Christensen said. "They've had this data for years so it's time for them to be held accountable with action instead of them just throwing up a bumper sticker that says 'diversity is important,'" he said.